Whoever they are, in the two Aston Martins at Sebring next month, the line-up currently doesn’t look as though it will be a very familiar one, to Sebring race-goers. Last year’s Brabham / Ortelli / Turner trio will have only a maximum of one of them back next month (in a DBR9). Last week’s Aston Martin test at Vallelunga saw V8 Supercar driver (for Ford Performance Driving) Jason Bright at the wheel of a DBR9, and he looks like a serious contender for a race seat at Sebring. 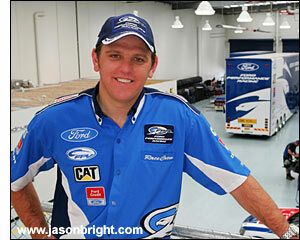 Bright was joined by Prodrive regulars Pedro Lamy and Stephane Sarrazin, and another newcomer in Nicolas Kiesa. A Danish presence at Sebring and Le Mans looks almost a certainty at the moment. Bright apparently matched the times of the Prodrive Aston Martin regulars, on the second day of the test (February 9). V8 Supercar rival Mark Skaife raced at Le Mans nine years ago, in a Lister Storm, but generally it’s a rarity to see the V8 men racing in GT cars (David Brabham can be considered a GT man racing, occasionally, in V8 Supercars).